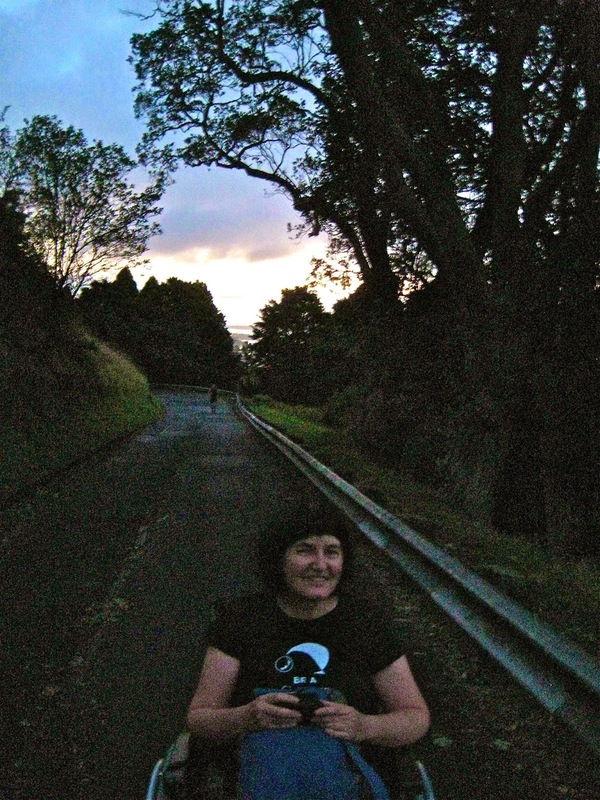 Audrey and April did a trial wheelchair climb up the maunga this morning, setting off before daybreak. It took 45 minutes going up and 15 going down. But we weren't quite first to the summit. A car overtook us in the summit carpark, at 6:50am. So the gate must have been opened early. Audrey is organising Love Your Mountain Day, 7 December 2014, the only day of the year when the summit road is free of traffic. It's her idea to invite wheelchair users to enjoy leisurely access on the day. The idea is part of a bigger plan for a communal walk and celebration at the summit. We'll post more about plans for Love Your Mountain Day at a later date! The trial ride up the maunga was surprisingly doable. There are enough flattish sections along the road to ease the effort. We were nearing the top before the sky lightened and the first runner appeared. The descent was tricky, due to the steep sides on the speed bumps and the slippery road surface after overnight rain. The exhilaration of being on the summit at daybreak was blighted by some distasteful graffiti. Compared with just five years ago, vandalism on the maunga seems relatively rare these days. So it was sickening to see such disrespectful and juvenile scribblings.